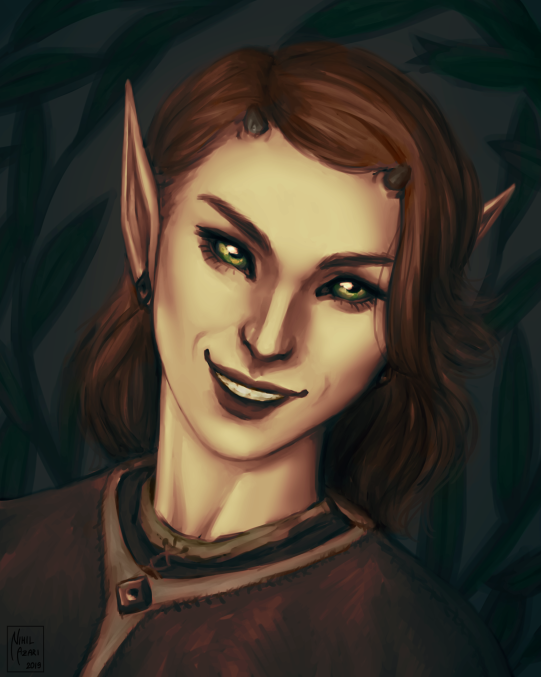 Ardynia is a 161cm tall Bosmer, brown hair which she mostly keeps at short-medium length, with big leaf-green eyes and two small horns on her forehead. She has a has short, but muscular body build. Generally, she wears in a more wild-ish fashion. Combination of leather-cloth, in brown grey colour duo. Rarely ever will one see her in a dress or even more fancy appearance. She prefers a more wild-ish look, which fits her personality. She has tattoos that go up her back and upper chest down through her shoulders and till her elbow. She also carries a satchel which is around her hip, commonly on her left side where she keeps her small notebook, crystals and ointment. Given the environment where she grew up, it made quite the impact on her personality. It made her quite cheerful, friendly, but also rather curious. Knowing it’s the usual characteristics of the Bosmeri society. With her cheerful nature she always managed to make easily friends. With her high tendencies of curious poking, she obtained the ability to patiently observe her surroundings, where she could just sit silently for hours, using only her basic senses, making presumptions and conclusions beforehand. Her patience is equal as her playfulness, which at times come into conflict. She loves having social interactions and doesn’t discriminate by visuals and/or rumours. She doesn’t care about race. She might proceed with caution on presumptions but definitely doesn’t lean on judgements prior meeting the party. Her experience has given her a quite open mind, but a cautious one as well. She’s a proficient and educated mage, even though she will not admit it nor show direct signs of it. She’s a big follower of the Green Pact. Her ways can often seem to be barbaric to the other races and cultures. She doesn’t subside to many-rules-culture. As she always states “You can live by just that many rules before it becomes boring .”. Living by the rules of the Green Pact, several social norms and moral rules, she believes that she no need for more rules to live by. 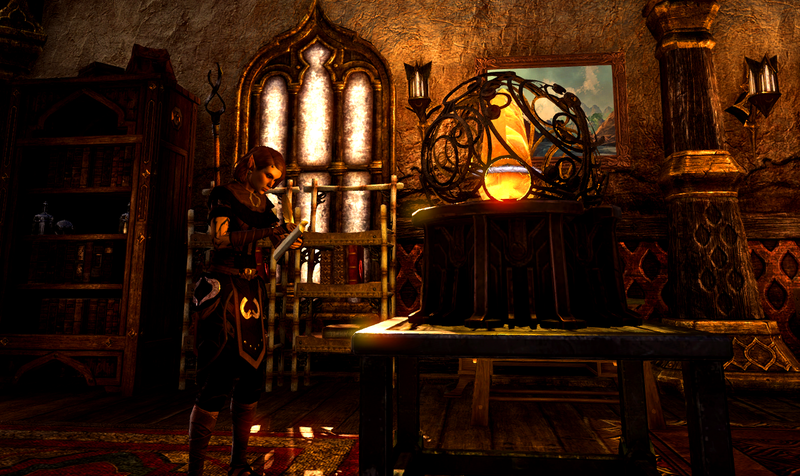 Her travelling spirit made her go to many places over Tamriel, where she would settle for a while before moving on. Tending to learn as much as possible about the culture, people and ecosystem around it. Carefully documenting her findings in a place probably known only to her. "Face the world with a smile, show it you can't be beaten." Fascinating character! Its a pleasant surprise to find a so complex post like this! 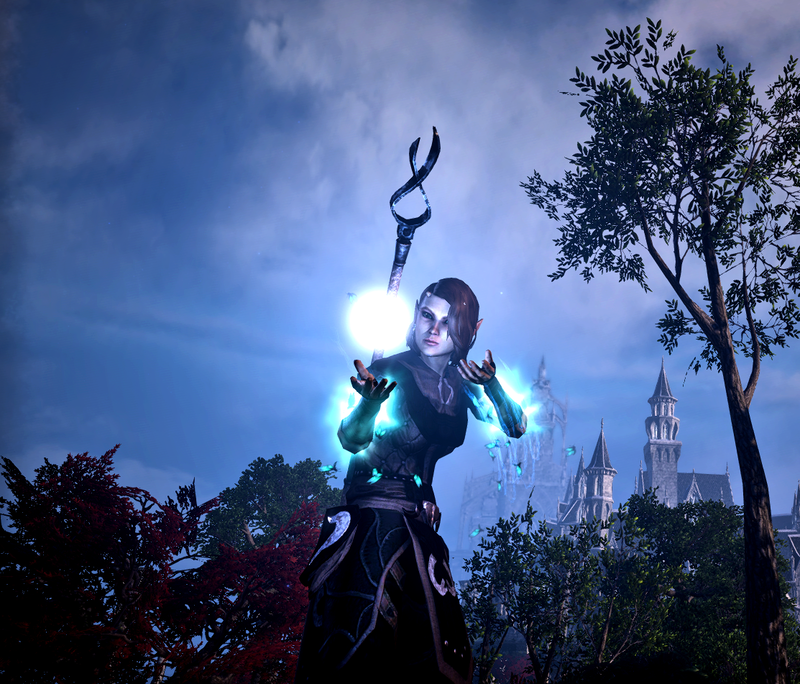 Though Im playing on the NA sever (depsite Im from Hungary..),I would like to meet this Bosmer,so I might gonna create my NA Altmer mirror image on EU as well! Hello neighbour! (I'm from Croatia)...Thank you and I would love to meet your Altmer ^^ Give me a headsup when you get around!